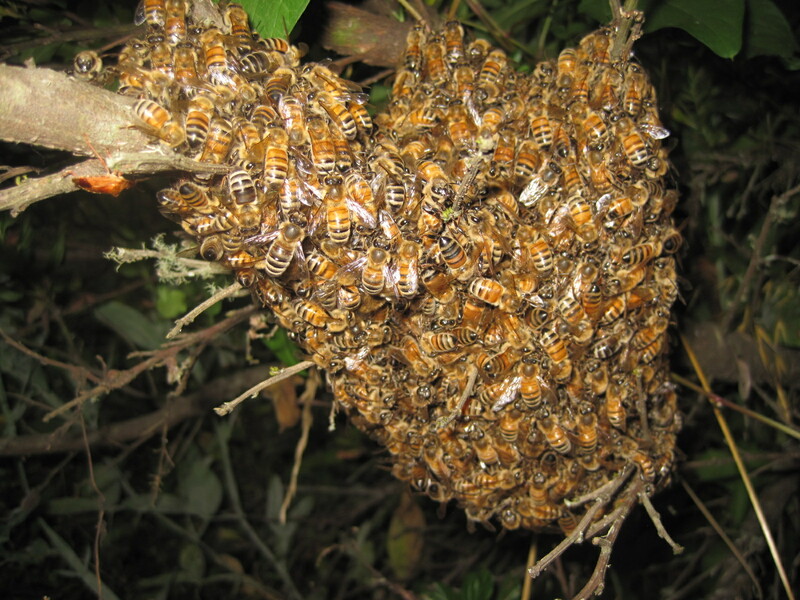 A noncommittal swarm has been gathering, dissipating, and regathering in front of my hives for three days now. After the initial panic, I did a careful inspection of the suspected mother colony. No queen cells, plenty of bees, a fat queen (marked 2013, no less) laying lots of beautiful eggs–everything check-normal but for the absurd amount of traffic in front of the hive. I hived the little swarm twice, only to have it abscond. It finally took off into the woods Monday afternoon…and returned by lunch on Tuesday. It rose and regathered three times just today. I am plagued with curiosity. Where did they come from? And just what are they thinking, swarming in mid-August?